If you celebrate a 1/2 birthday, then you might consider this easy party cake. It is just half of a cake! Why would you celebrate a half birthday? 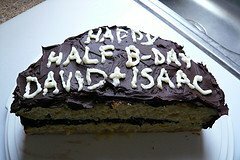 Some people, especially children, celebrate half birthdays. When a birthday falls in the summer, they may be away (or all their friends/prospective guests might be away), so they opt for a 1/2 birthday party when they are 5 1/2, 8 1/2, or whatever. That way the party falls during the school year. A smaller family celebration might happen at the time of the actual birthday. Even if you aren't having a party, it is still fun to celebrate a half birthday with a simple cake at supper!